This school year, my friend Sara and I are enjoying our little Charlotte Mason community, which consists of our two families. She has 5 children and I have 3, so we have a good little crowd, although technically only 4 of them participate in the majority of the activities. 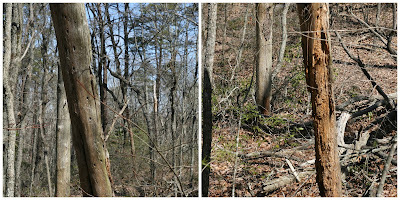 One thing we're working on perfecting, or at least improving, is nature study. I am not quite sure how to implement it correctly, so we've tried a couple of different things. We chose birds as our first topic, so I tried having us study things like different beaks, different wing types, etc. That wasn't a huge success. We tried spending our time outside at Sara's house, because they have a few acres out in the country. Sometimes we found things to draw, but mostly the kids wanted to play by the time we got out there since it was the last thing in our schedule for the day. This term, we're trying a different approach. We are discussing specific species of birds we are likely to encounter in our area, and drawing pictures of our "bird of the week" in our nature journals. This has worked well, and we've all noticed that we learn the markings of each bird pretty well, because we have to pay close attention while we work on our drawings. Both families have bird feeders, so we've been able to observe our birds in action. Good stuff! We also decided to take one week per month and go to a local park and observe nature in each season. 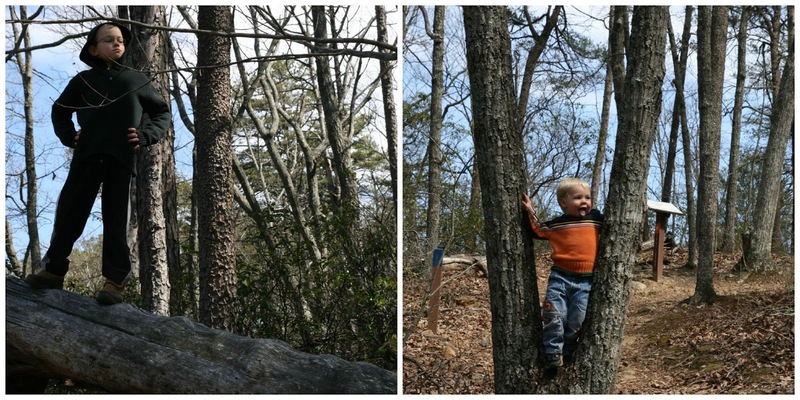 This was our first sojourn to Bakers Mountain Park, a local wildlife preserve with hiking trails and bird feeders. They even publish a list of birds you're likely to see there, so you can look for them when you visit. We managed to scare all the birds away today. :-) The kids were all so excited to go on a hike, we spent very little time actually observing anything, and certainly no attempt was made to be quiet so the birds might let us see them. There was lots of tree-climbing and running. I'm giggling just thinking about it; they were so full of joy, it wasn't in me to rein them in this time. It reminded me of my first nature study class in a different co-op. I sent the kids on ahead on a little trail, thinking I'd need to follow behind to make sure we didn't lose anyone. I learned that, in fact, I needed to go first, because they all sped through the trail, chattering merrily, and observed not one thing on the walk. One memorable quote was, "I saw some trees." (We walked through woods.) After that, I went first, and modeled observing things for them. We had a similar experience today. I actually took my backpack with nature guides, binoculars, a little magnifying jar, our journals, pencils and colored pencils. This turned out to be unnecessary. Some of the boys did notice some really cool moss that felt just like carpet, but of course, I don't have a nature guide to identify moss so we weren't able to learn anything more about it. When we got back to the picnic tables, and I asked the kids if they'd observed anything cool, no one had anything to say. One child, who shall not be named, actually said, "We didn't see any nature!" Both Sara and I laughed and laughed that. I threatened to call the Charlotte Mason police. Oh, my goodness - we had just spent quite a long time hiking through a beautiful area, and there was nothing to see?!? The child in question did specify that we were looking for birds, and we hadn't seen any. We did hear tufted titmice singing throughout the day, though, and we were finally able to identify the song thanks to our handy iBird app. Next time, I will make it clear that we are going on a NATURE WALK and that we are going to OBSERVE NATURE. It will most likely require a more concerted effort to be quiet (something at which we don't excel quite yet) and less running. It's a little challenging with our very small peeps, but we can work on it. After all, they are future nature students too! 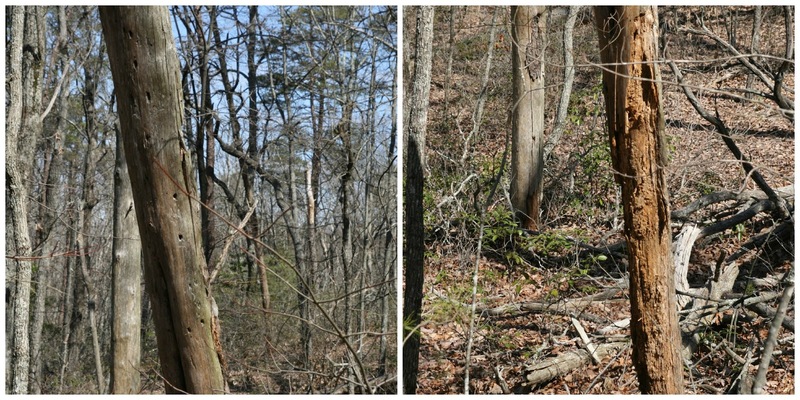 I'm not sure what did that to the bottom of the tree (picture on the right). Any thoughts? We also saw lots of lichens and mosses - my favorite things to find in the woods - and I'm pretty sure we found wild ginger! That was a first for me. 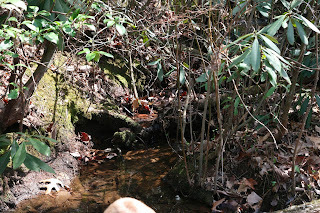 There was also a tiny stream running across the trail. Pretty sure all the littlest ones splashed in it. 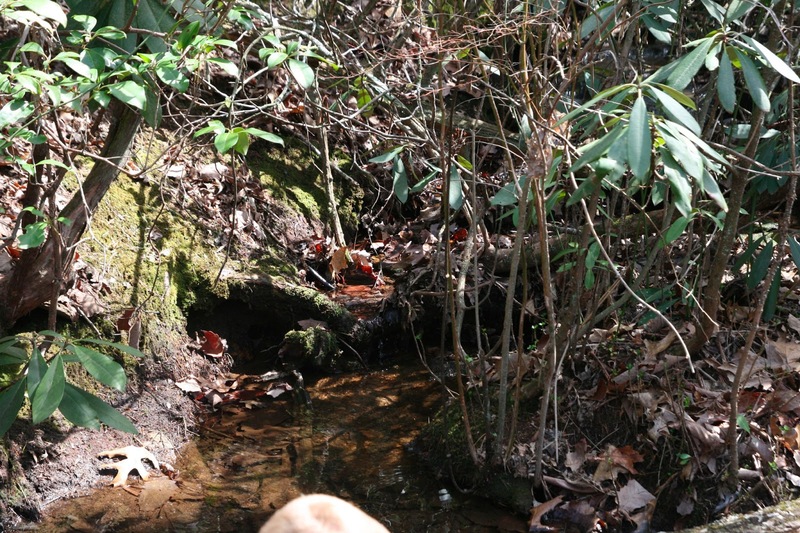 Naturally, the park's website says no wading is allowed in streams. Well, then, it's pretty silly to have one running right across the trail, don't you think? What little person could resist a splash or two? We had a wonderful time today. 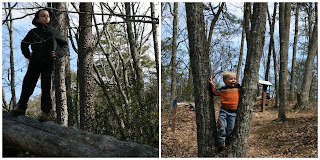 We went on quite a hike - we chose the hardest trails, I learned, upon reading the website after we got home. The kids got lots of exercise (as did the moms) and we got to know a little bit about the park. Our hope is that as we spend more time there, we will become familiar with this park in all seasons. I have hope for us.